Indian Institute of Art and Design Admissions 2018 will be done on the basis of iDAT 2018 which is conducted by IIAD Admission Committee. The Indian Institute of Art and Design (IIAD) in collaboration with Kingston University, London offers UG degree programmes at its campus in New Delhi. iDAT 2018 Application Form for the 2nd round of entrance exam is available from 24 April 2018. The last date of Indian Institute of Art and Design Admissions application process is 25 May 2018. Candidates should submit their application form before the final date. IIAD offers three full-time B.A. (Hons) programmes of 4 years duration each. Upon graduation, the degrees will be awarded by Kingston University, London. iDAT 2018 is the entrance examination for admission to Fashion Design, Communication Design, and Interior Architecture. iDAT 2018 Design Aptitude Test will be conducted on the dates mentioned below. The iDAT examination & application process will be conducted in two rounds. The round 1 and 2 schedule is mentioned in the following table and round 2 details will be updated on this page soon. Keep visiting motachashma regularly for further updates. The Faculty of Art, Design & Architecture at Kingston University, London is listed amongst the top Art and Design Schools in the UK by Guardian Subject League Tables. It has also been ranked as the top 2 Fashion School globally by Business of Fashion and as the 9th most innovative institution across Europe and USA by Red Dot Rankings. Internships and Placements: IIAD has a career development centre which assists students with internships and industrial projects across leading organizations in India. Students will get a chance to work with renowned names like Ashima-Leena, FDCI and avail internship opportunities offered by Kingston University. IIAD will also assist the students with their final placements. Candidates must have appeared/passed the CBSE/ISC/IB or any other equivalent Board Class 12 examination in any discipline. Candidates who have recently appeared for the examination and are awaiting their results may also apply. Candidates who have secured 70% aggregate in the CBSE/ ISC/ IB or any other equivalent Board Class 12 examination in any discipline may apply for the scholarship. Candidates can fill the application form for iDAT 2018 entrance exam through both online & offline mode. Both the procedures are mentioned below. Candidates should follow the steps which are given on this page below to fill the application form. Candidates can click on the following link to fill the application form. Candidates seeking scholarships must download and complete the scholarship application form. If the candidate has applied online then they have to mention the application form number in the top right-hand corner of the scholarship form. Completed application form with a recent passport size photograph. Extra sheets used for answering questions on the application form. Application fee Receipt if paid through cash or demand draft. Completed Scholarship application form, if applicable. The duly filled in Application Form has to be sent to the following address along with above-mentioned enclosures at the earliest. But if applied online and the payment has been made by Demand Draft then the candidates have to send the Demand Draft to the following address and they have to fill in the Details of Demand Draft while applying Online along with the picture of the Demand Draft. Mode 3: By cash: If in case the candidate is purchasing the application form from the outlets then they can pay the Application Fee in cash. 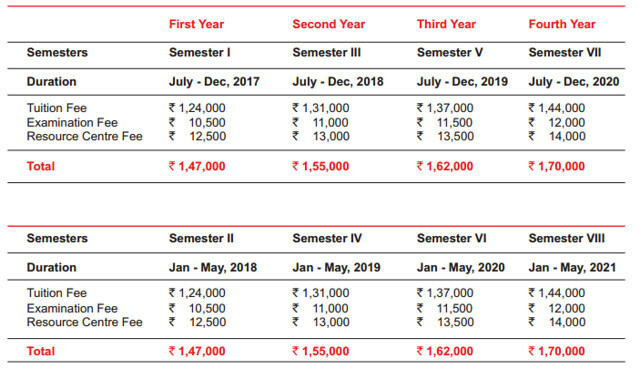 The annual course fees for each of the undergraduate B.A. (Hons) programmes is approximately 3.5 lakhs plus taxes. The entire 4 years program will cost around Rs. 14 Lacs excluding the Hostel and Mess Fees. A comprehensive interview and portfolio assessment (Applicable to all). The scholarship final result will depend also on performance in the IIAD Design Aptitude Test (iDAT), personal interview and portfolio review. It is a mandatory two-hour and thirty minutes test in which IIAD Admission Committee will review each student's aptitude for observation, drawing and design skills, imaginative and creative expression, and visual and communication strengths. Test papers and answer sheets will be supplied by the IIAD Examination Centre on the day of testing. Personal interview: The candidate will be evaluated on their understanding of basic art and design concepts and industry awareness. Emphasis will be placed on the individual's maturity, confidence and communication skills. Personal portfolio: Each candidate appearing for a personal interview MUST carry their creative portfolio. Portfolio work can include sketches/drawings, paintings, art collages, needle-work, three-dimensional projects, digital design, web design, graphic design, sculpture and/or photography. The candidates seeking Scholarship must fill the scholarship Application form and if they have filled the IIAD Application Form they must write their Application number in the right-hand corner of the Scholarship Application form.